Kaziranga Tiger Reserve, Assam: With over 2000 Greater One-horned Rhinoceros Rhinoceros unicornis and over 100 Royal Bengal Tigers Panthera tigris among several other endangered wild species in Kaziranga Tiger Reserve as well as in other wildlife areas of the state, Assam is undoubtedly a bright spot of biodiversity not just in the country but also at the global level. However due to these extremely rich bio-resources, the State also remains a prime target of wildlife poachers, smugglers and traders who have now extended their nefarious activities on cyber space as well. In light of this, on 2nd February 2019, TRAFFIC in partnership with the National Tiger Conservation Authority (NTCA), Police Radio Training School (PRTS), Indore and WWF-India organized a cybercrime monitoring workshop at Kohora range of Kaziranga Tiger Reserve. 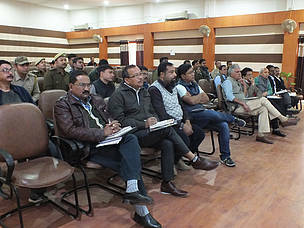 During the workshop thirty forest officials from five wildlife divisions i.e. Eastern Assam Wildlife Division, Nagaon Wildlife Division, Bishwanath Wildlife Division, Mangaldoi Wildlife Division, and Sonitpur Wildlife Division learnt the skills for cyber monitoring, and investigation tools and techniques. Illegal wildlife trade is one of the most significant threats to wildlife and has now grown to spread its wings across cyberspace. This has been a major concern in wildlife law enforcement in the country considering that the internet users are increasing every day resulting in a growing expanse of a network of poachers, traders, and consumers on this platform. To deal with this, TRAFFIC in collaboration with WWF-India, NTCA and PRTS had launched a new programme titled ‘CyberCLAW’ through which specialized trainings are conducted for the forest officials for combatting wildlife crime on cyber space. 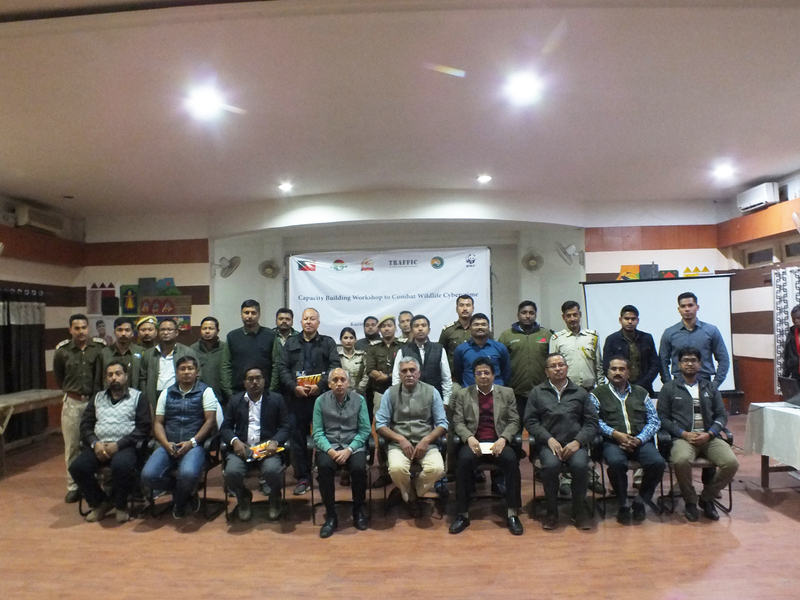 The workshop in Kaziranga was the second in the series with the first one having been organized on 26-27 December 2018, at Corbett Tiger Reserve for the forest officials of Uttar Pradesh and Uttarakhand. The training workshop in Kaziranga Tiger Reserve was imparted by experts in the field of monitoring cybercrime through sessions on intelligence, investigation, and search and seizure techniques; communication device investigation; cybercrime scene management; digital intelligence collection; wildlife forensics; telecom surveillance and Call Detail Record (CDR) analysis and IPDR – (CDR of IP address) analysis. Mr Varun Kapoor, Additional Director General, Madhya Pradesh Police and Mr Afzaal Khan, Sub Inspector / Incharge Technical Cell PRTS Indore led this one-day training. Mr Varun Kapoor, IPS and Additional Director General, Madhya Pradesh Police said, “The phenomenon of monitoring wildlife cybercrime has been fairly naïve in India with agencies employing traditional monitoring protocols. The demand for wildlife commodities on such growing platforms has further led to a surge in poaching and illegal wildlife trade. Therefore, it becomes imperative to understand and devise effective methods to monitor virtual markets to check illegal wildlife trade”.Mr N. Vasu, IFS (retd. ), former Principal Chief Conservator of Forests (HoFF), Assam while stressing on the use of CDR analysis in rhino protection said that we need to strengthen our intelligence gathering especially on online platforms as the poachers and smugglers are also getting tech-savvy. Mr D. P. Bankhwal, IFS(retd. ), former Principal Chief Conservator of Forests /Chief Wildlife Warden added, “We must regularly conduct such trainings for the forest officials and over a period of time select and train few individuals who can become specialist in this field thus building an important capacity in every department. This skill will certainly be a game changer in the field of wildlife conservation and protection”. Mr Akashdeep Baruah, IFS, Chief Conservator of Forest/Field Director Kaziranga Tiger Reserve said, “We are thankful to TRAFFIC India for leading on this and organising this unique workshop. For long we have felt the need to strengthen our cyber space monitoring skills and protocol and such workshops provide us with an opportunity to do so”. For any queries, please contact Dilpreet B. Chhabra, Senior Manager-Communications, TRAFFIC’s India office at dilpreet.chhabra@traffic.org or call her at 09899000472.